No Trucker should be without a copy of "Hours of Service". Pull Out sheet for Driver and Company Supervisor to sign and place in Employee′s Driver′s File. Don′t Leave Home Without It. RoadTrucker® Recommends Independent Drivers split the box to save money. 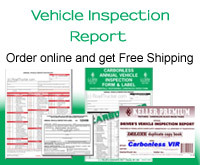 RoadTrucker′s selection of Vehicle Inspections Reports are priced to keep you out of the poor house. 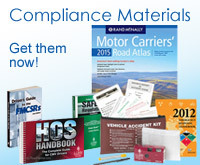 Helps you meet DOT requirements for proper documentation of hazmat shipments (49 CFR Part 172, Subpart C),available in with carbon and carbonless, 3- ply, snap-out format. 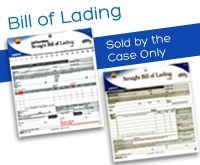 If your Driver′s Daily log books are not legible, it is just like not having a log book at all! 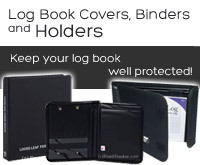 A good quality log book cover will also keep your logbook from becoming dog-eared and tattered. 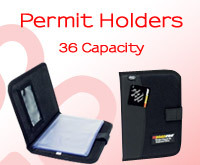 RoadPro′s 36 Capacity Permit Holders Measures 5.75" Width and 8" Height. It has Black Mesh Covers with New Soft Black Material and a Hook′n Loop Closure. Each Holder contains 18 plastic sleeves. Each sleeve can hold 2 permits. 1 in the front and 1 in the back.